Some of my favorite meals to cook are the ones Derek and I can do together and have a blast doing it. I love this recipe idea because it lets every family member have a part. It is nothing gourmet by any means, but it is fun and family friendly! If you have kids that like to help in the kitchen, this would be a good meal to let them in on! 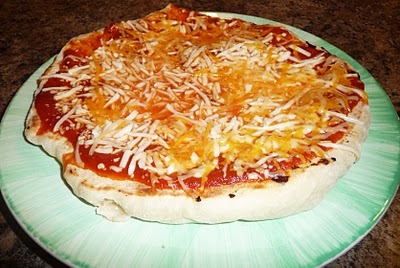 All I had on hand today was cheese, but you can top it any of your favorite toppings! 1. Mix well and set it to rest. 2. After the dough has set and raised, divide the dough into 4 balls. Press each ball flat. It doesn’t have to be round, smooth or pretty. 3. Cook the flattened piece of dough on one side of the griddle and cook like a pancake waiting for both sides to brown. While the dough is cooking, put some chopped veggies on the other side of the hot griddle if you want to use them as toppings (I didn’t because I didn’t have any on hand today). 4. While cooking the second side, spread the first side with tomato sauce, pepperoni, grilled veggies, and mozzarella cheese. Make it however you like it best or use whatever is on hand. Alfredo sauce or pesto is a great alternative to tomato sauce. 5. When the second side is browned, slide it under a broiler and let the cheese get golden brown.